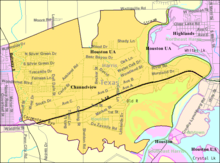 Channelview is a census-designated place (CDP) in the U.S. state of Texas within the Houston–Sugar Land–Baytown metropolitan area and Harris County. The population was 38,289 at the 2010 census. The Handbook of Texas describes Channelview as "an oil refinery suburb of metropolitan Houston." Channelview was given its name since it is located on the northeastern curve of the Houston Ship Channel. The site of Channelview was home to Lorenzo de Zavala, one of the founding fathers of the Republic of Texas. During World War II the area south of Market to the Ship Channel, and what is now DeZavala St. to the tollway, was part of the U.S. Army Ordnance Depot. Channelview was the site of a notable murder plot occurring in 1991. Wanda Webb Holloway was upset that her daughter, Shanna, had failed two consecutive years to make her junior high school's cheerleading squad. Holloway came to believe that the fault lay not with Shanna's inability to make the squad, but with Verna Heath, whose daughter, Amber Heath, was a main rival of Shanna's. Holloway asked Terry Harper, her former brother-in-law, to find a hit man to murder Verna Heath, hoping that Amber would be distraught and perform poorly in tryouts, thus allowing Shanna to make the squad. However, Harper notified authorities of the plot, and an undercover police officer arrested Holloway. Holloway argued that Harper was guilty of entrapment, saying that she never intended anyone to get killed. A jury sentenced Holloway to 15 years for attempted murder. The story was made into a 1993 HBO movie, The Positively True Adventures of the Alleged Texas Cheerleader-Murdering Mom. Channelview is also home to Houston Astros pitcher Chris Sampson and former outfielder Glenn Wilson. Another famous athlete to come out of Channelview is former Chicago Bears (NFL) wide receiver Johnny Knox. He graduated class of 2005 from Channelview High School. In 1997 Coy Wayne Wesbrook committed mass murder in Channelview, killing five people. According to the United States Census Bureau, Channelview has a total area of 18.1 square miles (47.0 km2), of which 14.8 square miles (38.3 km2) is land and 3.4 square miles (8.7 km2), or 18.46%, is water. As of the census of 2000, there were 29,685 people, 9,189 households, and 7,369 families residing in the CDP. The population density was 1,831.2 people per square mile (707.1/km²). There were 9,874 housing units at an average density of 609.1 per square mile (235.2/km²). The racial makeup of the CDP was 63.15% White, 13.03% African American, 0.55% Native American, 2.03% Asian, 0.06% Pacific Islander, 18.29% from other races, and 2.89% from two or more races. Hispanic or Latino of any race were 37.11% of the population. There were 9,189 households out of which 48.6% had children under the age of 18 living with them, 60.4% were married couples living together, 13.8% had a female householder with no husband present, and 19.8% were non-families. 15.7% of all households were made up of individuals and 3.7% had someone living alone who was 65 years of age or older. The average household size was 3.22 and the average family size was 3.60. In the CDP, the population was spread out with 33.7% under the age of 18, 10.6% from 18 to 24, 32.2% from 25 to 44, 18.3% from 45 to 64, and 5.2% who were 65 years of age or older. The median age was 29 years. For every 100 females, there were 100.6 males. For every 100 females age 18 and over, there were 97.5 males. The median income for a household in the CDP was $42,968, and the median income for a family was $45,638. Males had a median income of $35,592 versus $26,423 for females. The per capita income for the CDP was $15,115. About 11.5% of families and 13.7% of the population were below the poverty line, including 17.3% of those under age 18 and 15.4% of those age 65 or over. The United States Postal Service operates the Channelview Post Office at 531 Sheldon Road. Channelview ISD operates schools within the CDP. The district has one pre-K campus, seven elementary schools (Harvey Brown, Crenshaw, DeZavala, Hamblen, McMullan, Schochler, and Cobb), two junior high schools (Alice Johnson Junior High School, and Anthony Aguirre Junior High School,), L.W. Kolarik 9th Grade Center, and Channelview High School. In addition CISD operates the Endeavor High School of Choice, an alternative high school. Sections of Channelview CDP in the Galena Park school district are zoned to schools outside of the Channelview CDP. The sections are divided between the attendance boundaries of  Sam Houston Elementary School, and North Shore Elementary School, which are in the Cloverleaf CDP. All residents are zoned to Cobb Elementary School, North Shore Middle School in the Cloverleaf CDP, and North Shore Senior High School with two campuses in the Cloverleaf CDP. Family Christian Academy is located in Channelview. Harris County Precinct 2 operates the V.V. Ramsey Community Center and the M.L. Flukinger Community Center at 16003 Lorenzo Street. Also the Old River Terrace Park on Market St.
^ a b "Profile of General Population and Housing Characteristics: 2010 Demographic Profile Data (DP-1): Channelview CDP, Texas". U.S. Census Bureau, American Factfinder. Archived from the original on September 11, 2013. Retrieved June 27, 2012. ^ Suro, Roberto. "Texas Mother Gets 15 Years In Murder Plot." The New York Times. September 5, 1991. ^ Grisson, Brandi (2 April 2012). "Appeals Court Orders Re-evaluation of Death Row Case". Texas Tribune. Retrieved 1 March 2016. ^ "Geographic Identifiers: 2010 Demographic Profile Data (G001): Channelview CDP, Texas". U.S. Census Bureau, American Factfinder. Archived from the original on September 11, 2013. Retrieved June 27, 2012. ^ "About CISD Archived October 7, 2011, at the Wayback Machine." Channelview Independent School District. Retrieved on October 21, 2011. ^ "Post Office Location - CHANNELVIEW." United States Postal Service. Retrieved on December 3, 2008. ^ "Welcome to Channelview ISD Archived January 19, 2009, at the Wayback Machine." Channelview Independent School District. Retrieved on December 25, 2008. ^ Home Page Archived October 6, 2000, at the Wayback Machine." Galena Park Independent School District. Retrieved on December 25, 2008. ^ "Campuses Archived 2009-01-25 at the Wayback Machine. "Channelview Independent School District. Retrieved on December 26, 2008. ^ "Havard.pdf Archived 2009-02-27 at the Wayback Machine." Galena Park Independent School District. Retrieved on December 20, 2008. ^ "SamHouston.pdf Archived 2009-02-27 at the Wayback Machine." Galena Park Independent School District. Retrieved on December 20, 2008. ^ "NorthShoreElem.pdf Archived 2009-02-27 at the Wayback Machine." Galena Park Independent School District. Retrieved on December 20, 2008. ^ "Cobb.pdf Archived 2009-02-27 at the Wayback Machine." Galena Park Independent School District. Retrieved on December 20, 2008. ^ "NorthShoreMiddle.pdf Archived 2009-02-27 at the Wayback Machine." Galena Park Independent School District. Retrieved on December 20, 2008. ^ "NorthShoreHighandSenior.pdf Archived 2009-02-27 at the Wayback Machine." Galena Park Independent School District. Retrieved on December 20, 2008. ^ "Contact & Location Archived 2017-01-05 at the Wayback Machine." Family Christian Academy. Retrieved on January 5, 2017. "Family Christian Academy 14718 Woodford Drive Houston, Texas 77015"
^ "V.V. Ramsey Community Center/M.L. Flukinger Community Center Archived 2009-08-13 at the Wayback Machine." 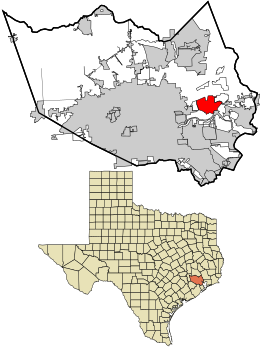 Harris County, Texas. Retrieved on December 3, 2008.